Oooh, it's been getting chilly here in the High Desert and that makes me crave hearty meals like stews and roasts. 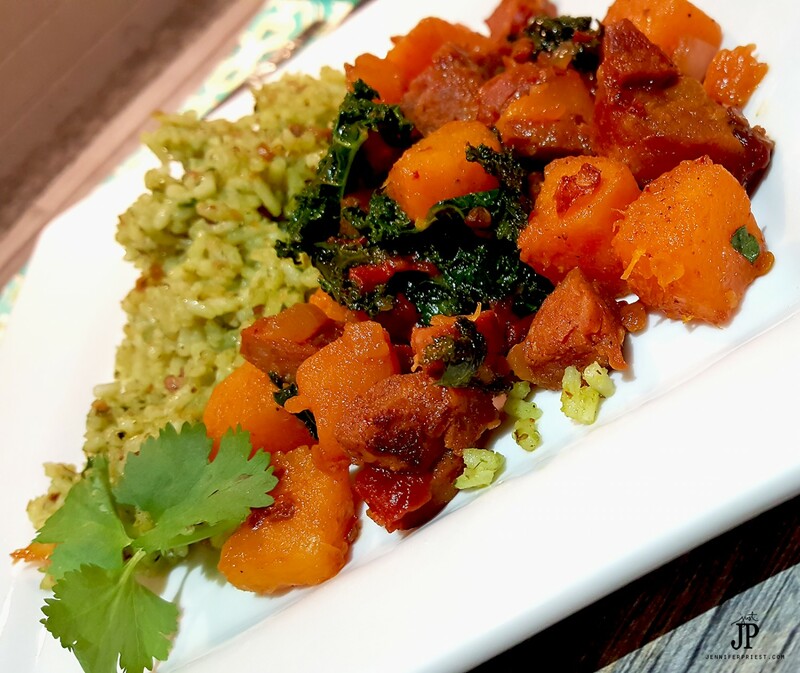 I've been seeing lots of hash recipes for Thanksgiving leftovers but since I do paleo and we spend Thanksgiving at Disneyland, I decided to do a different take on hash with this chorizo: Paleo Chorizo Hash with Butternut Squash and Kale. 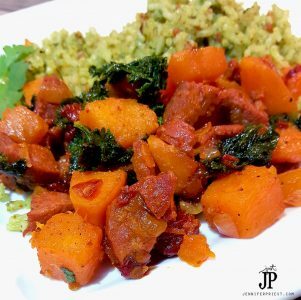 Rather than use potatoes for this chorizo hash, we decided to go with a fall butternut squash which has less starch than a potato. We bought pre-cubed squash but you can cut it up yourself if you like. We added kale for a bit of color and crunch as well as a chipotle pepper in adobo sauce for a spicy kick. If you don't like spicy food, skip the pepper but honestly, that pepper paired with the spanish style chorizo is part of what makes this dish so good. A delicious kale and butternut squash hash with chorizo. 1. Dice the chorizo links into bite sized pieces. 2. Saute onion in butter in a pan until translucent. 3. Add the chorizo and squash. Cook until the squash is cooked but still firm. 4. Add two chipotle peppers, diced. 5. Add 1 Tbsp of the adobo sauce from the can of peppers to the pan. 6. Add the chicken stock. Cook until the chicken stock is reduced. 7. Add kale. Cook until the kale just wilts. Remove from heat immediately and serve. If you don't like spicy foods, use less chipotle peppers or skip them altogether. 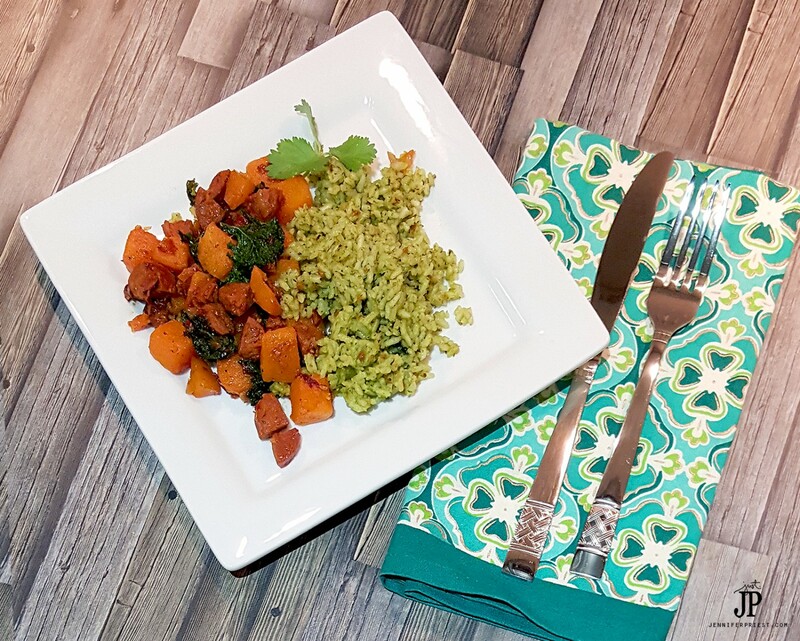 We served this Paleo Chorizo Hash with a side of Cilantro Pesto Rice. Rice isn't very paleo but Xaver loves it. This rice is a take on Mexican Rice but with cilantro pesto instead of the traditional tomato sauce. I'll be sharing the recipe for this delicious side dish soon!